The Butterknife trail is located in the Third Flats section of the BLM Bangs Canyon Management Area. The Third Flats Area doesn't have an official parking area. There are signs near the entrance that direct people to the Bangs Canyon Staging Area to park. The area around the kiosk is all posted 'No Parking'. With that said, most people who use the area either park on the hill on the west side of Little Park Road or if they have a high clearance vehicle they have the option to drive past the trailhead kiosk and park in one of the other spots a little further in. 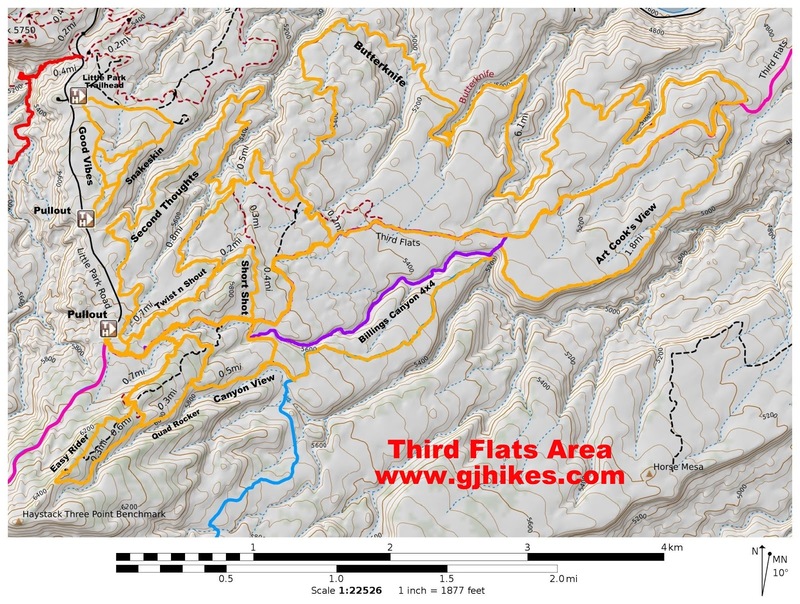 For this hike you could cutoff 3.4 miles by driving in to the Rocky Stumble connecting trail and beginning from there. The road is steep and rocky in places and it seems hard to imagine a 2-wheel drive vehicle making the drive. The upper end of the Butterknife trail begins where the Twist-n-Shout trail ends. 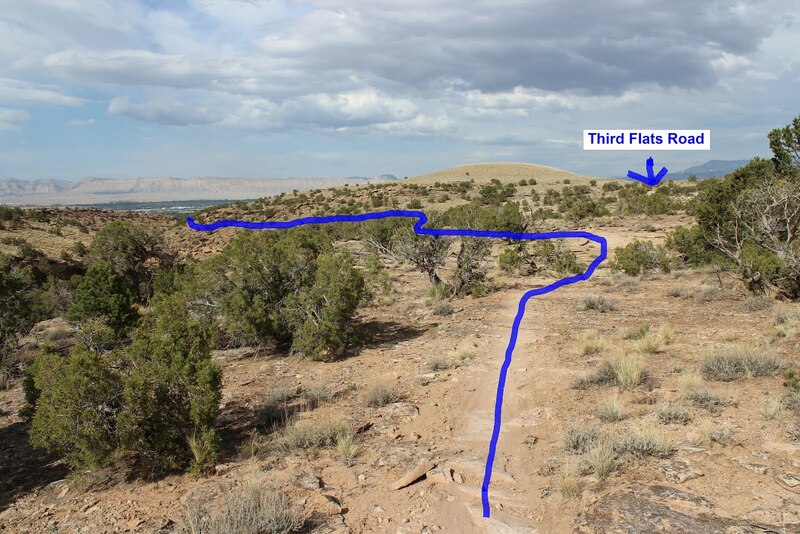 Mountain bikers usually ride down the Twist-n-Shout trail to the Butterknife trail and then return via the Third Flats Road. It is 2.4 miles to the Butterknife trail via Twist-n-Shout and 2.1 miles via the Rocky Stumble trail. 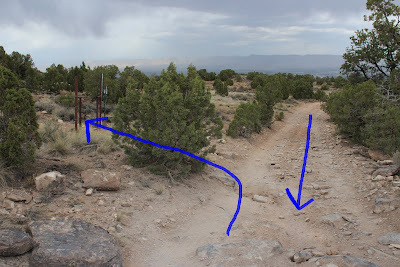 This post follows the Third Flats road to the Rocky Stumble cutoff trail and takes it for the remaining 4 tenths of a mile to the Butterknife trail. Measuring from the parking area across Little Park Road you continue past the Quad Rocker turnoff at .4 miles, the Cedar Point Road turnoff at .7 miles, the connector that leads to the top of the Billings Canyon Jeep trail and the Canyon View trail at .9 miles and arrive at the turnoff for the connector trail to the Rocky Stumble trail at 1.7 miles. The trail begins on the left, or north side, of the road and there is no trail name on the sign. If you were to continue on down the Third Flats road for another quarter mile you would come to the Rocky Stumble trail. That makes this route a shortcut. The cutoff the the Rocky Stumble trail is fairly easy hiking. A little over halfway to the Butterknife trail it connects up to Rocky Stumble where you will want to bear left. At the 2.1 mile point of the hike you come to the beginning of the Butterknife trail. At one time there was some writing on the trail marker here that was probably meant for mountain bikers that said; 'put on your big boy pants'. It was probably a good admonishment for anyone using the trail. Hiking the Butterknife trail turns out to be a pretty good journey. The trail begins by descending around the upper hills, continually losing altitude, as it heads toward the Gunnison River. The trail picks up the south rim of a canyon leading toward the river that looks like it would be fun to explore by itself. There is a home nestled in next to the cliff on the north side of the canyon that overlooks the river. After having hiked about 5.2 miles the trail begins turning east just before heading out on a rocky point that looks like it would take you to a lookout right above the river. 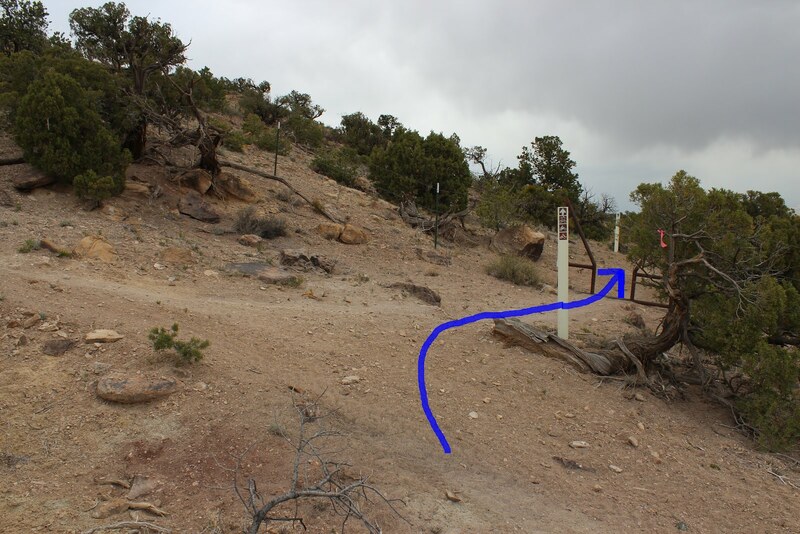 The trail travels around the canyon for the next 1.5 miles until you are right across the canyon from the rocky point. There are a few places where the trail does provide a few hills to climb. Since the trail was made mostly with mountain bikers in mind none of the hills are too terribly steep. About 6 miles into the hike you might start feeling like maybe you have bitten off more than you can chew and rather than call out search and rescue to haul you back to your vehicle you might like to know that you are within a few hundred yards of the Third Flats Road. 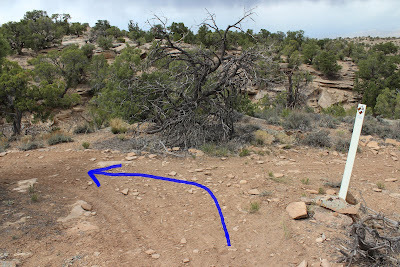 At this point the trail is wrapping around the back of one of the canyons where there is only a minor hill to climb to get up to the road. 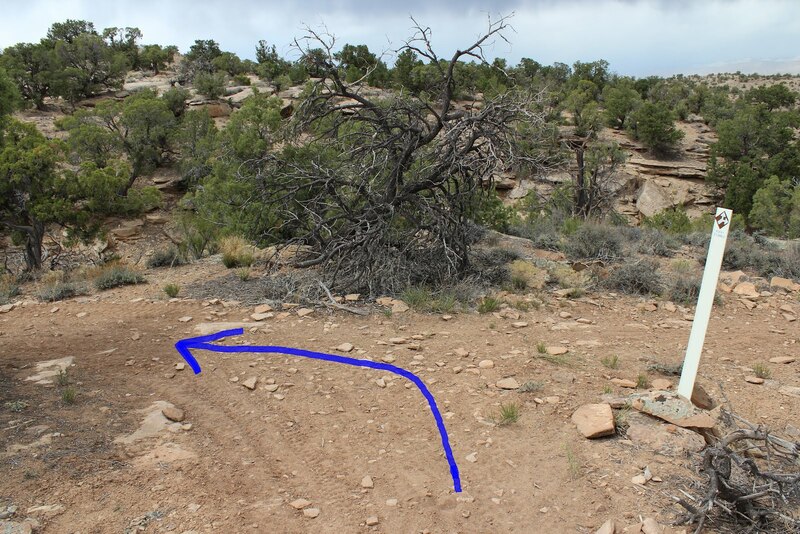 Nobody likes quitting on a hike before they are finished but if you head due south at this point, or hike up the drainage when the trail cross the back of the wash, you can't miss the Third Flats Road. If you have no since of direction or tend to get lost once you step off the path you probably better tough it out. You should come out on the road about 2.8 miles from the parking area and would have shortened the hike by almost 4 miles. About 6 tenths of a mile further along the trail is another spot where the Butterknife trail gets even closer to the Third Flats road. There is even a game trail that you can follow out of the back of the wash that comes out on the road after just a couple hundred feet. When you see the little rounded hill without any trees growing on the top of it you are in the canyon that comes closest to the road. The Butterknife trail goes around the north side of the hill and keeps going around the hill until it comes out on the road just down the hill from the Art Cooks View trail. When you come around the last hill you are at the closest point to the river. The land near the river is private property. On the hill across the river is the Spy Glass subdivision on Orchard Mesa and down around the bend is the roller dam for the Redlands Canal. Once the trail comes to an end at the Third Flats Road it is pretty much up hill all the way back. The first quarter mile of the road is probably the steepest and once you get that out of the way you can cruise along at a much easier pace. It is right at 1.3 miles back to where the loop started and 4 miles overall from the lower end of the Butterknife trail back to the parking area on Little Park Road. 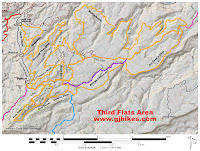 The trail gains over 900 feet of elevation making the climb back to the road but that is spread out over the 4 miles and there is a pretty good mix of open flats to go along with the hills. If you are up to the task the Butterknife trail is well worth the effort. There are a colorful variety of wildflowers in the spring and a few deer and elk in the fall and winter. As usual for the Dakota formation there were spots with nice specimens of chert and moqui balls or shaman stones of all sizes. The rocky canyons are very scenic and look like they would be an adventure to explore. There aren't any water sources and you can't get all the way down to the river without trespassing so you will need to bring plenty with you. I went through a 100 oz. bladder and 2 - 20 oz. bottles of Gatorade with the temperatures only in the 70's F. If you would like to see it for yourself then all you have to do is 'Take a hike'.